Specializing in all types of games, toys, collectibles and children's educational toys & games. Board Games are on the rise and have never been more popular. There are literally games for everyone. From the classics (Chess, Monopoly, Scrabble) to the more exotic (Settlers of Catan, Star Wars X-Wing, Pandemic), even the party games have evolved (Wits and Wagers, Codenames, Fluxx). You will find a new gem to add to your collection. Come on in and see what you've been missing all your life. Card Games are fun, competitive and collectible. Magic the Gathering, Pokemon, Yugioh, yup, we carry those and much more! We also have a huge collection of Magic the Gathering card singles in stock too. And a nice selection of Star Wars Destiny singles too. Collectibles are fun and add something to the mundane of everyday life. Spice up your bedroom, workspace or bookshelf with something new, fun and cool today! Harry Potter items? Disney Plush? Maybe get that favorite TV show Pop figure? Children are our future. Educating our children is vital and should be a priority for any parent. This is why Family Game Night has a huge selection of educational toys and games for all ages. The early educational games are designed to be fun, engaging and educational for your child. Kids learn while having fun and retain the knowledge better. Enrich your child's life today. Teach them with games! Looking for a new game, but want to test it out before you buy? Or maybe you're confused about our products and just want to "try before you buy"? 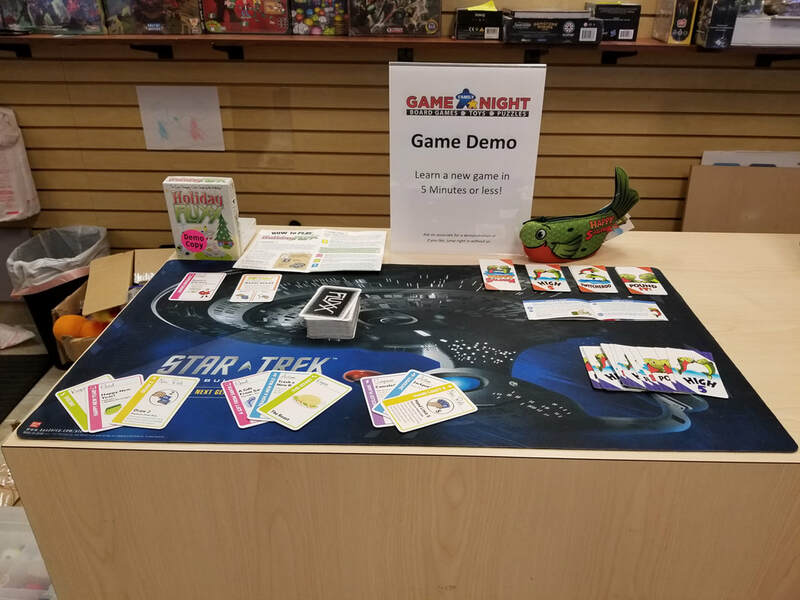 Our store is always displaying demo games for your convenience. Let us show you how to play the game first. Then we let you take that new game for a "Test Drive" before buying. New demos are available on a rotating schedule. For a complete list of which games are currently on demo display, refer to our website and Facebook! Huge sales on all of our Anime merchandise! Snag a deal while supplies last. Details in store.